Jesus and the Pharisees and Sadducees have a tumultuous history between them. Dare I say these two groups of religious hypocrites wrought the ire of the Son of God? 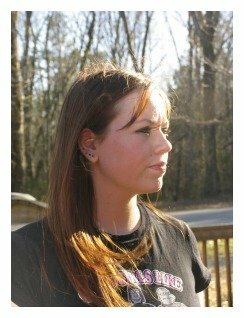 Please read John 18:12-28 before starting GraspingGod.com's free Bible study lessons, #3.07. Previous lesson: Jesus' Arrest #3.06. 1) Who were the Sadducees? 2) Who were the Pharisees? 3) What is a Scribe? 4) What is the Sanhedrin? Thanks for coming by another awesome Bible study. Let's talk Jerusalem politics, and how it played a major role in Jesus' crucifixion. Sadducees were an upper class of Jewish priests, merchants, and aristocrats around the times of Jesus Christ (Acts 5:17). The Sadducees were conservative politicians and theologians who relied upon the original laws of Moses found in the first five books of the Bible (aka The Pentateuch). They didn't adhere to the tradition of the elders, which was the law system built by the Scribes. Nor did they want anything to do with political movements that would upset their social standing. The Sadducees believed Jesus of Nazareth threatened the status quo in Jerusalem and they held great suspicions about him. A major theological problem they possessed was their choice to not believe in anything supernatural. This belief eliminated spiritual beings (Acts 23:7-8), miracles and an eternal afterlife. Jesus was always at odds with the Sadducees, for obvious reasons (Matthew 16:1-12; 22:31-34). They were meeting with the supporters of Herod Antipas to plot Jesus' death (Mark 3:6). 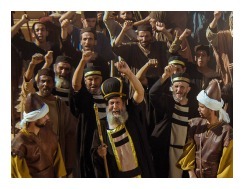 Pharisees originated in the 2nd Century B.C. from a group of Jews called the Hasidim. Hellenism (aka Greek culture) had eroded pure Judaism, so the Hasidim rebelled in response by holding strictly to the Jewish ritual laws. The Hasidim were greatly used by God when King Antiochus IV of Syria strove to destroy the Jewish religion. The Hasidim joined the revolt of the Maccabees to triumphantly defend the Jewish faith. Both the Essenes and the Pharisees emerged from this single political party. The Essenes separated from Judaism and formed isolated Jewish communities. The Pharisees held to the traditional Jewish political structure, and eventually became a large part of the Greek and Jewish governments. The Pharisees later saw members being assigned to the Sanhedrin. The Pharisees slowly evolved into a religious and political party based in Palestine during the times of Jesus Christ. The Pharisees plotted Jesus' death for years (John 7:30; Matthew 9:3). 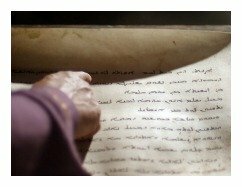 A Jewish Scribe was a member of a highly educated class in ancient Israel who studied the Hebrew Scriptures. Their position as Torah Scribe allowed them to serve as teachers, copyists and editors. They were the highest authorities in the knowledge and interpretation of the laws of Moses. Their research and judgments would create laws, eventually becoming known as the tradition of the elders. A Jewish Scribe was greatly esteemed by the public, which of course, led to their high social ranking by the times of Jesus Christ. The New Testament often refers to the Torah Scribes as lawyers which denotes their standing as experts in the Mosaic Law. A Jewish Scribe, during the times of Jesus, would have inevitably been linked together with the Pharisees and the Sanhedrin. The Sanhedrin was the supreme court and legislative body of Israel. They were the highest ruling assembly presiding over the Jews. 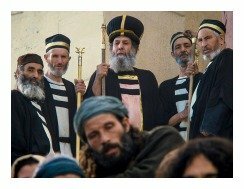 The Sanhedrin was also the court of justice, which consisted of 71 members, made up of the Sadducees (aka chief priests and elders), Pharisees and the Jewish Scribes. The Sanhedrin's top official was Israel's high priest, usually a Sadducee. Some known members of the Sanhedrin included Joseph of Arimathea (Mark 15:43), Gamaliel (Acts 5:34), Nicodemus (John 7:50), the high priests Annas and Caiaphas (Luke 3:2) and Ananias (Acts 23:2). At times, the Sadducees and Pharisees would vote along party lines, much like the Democratic and Republican parties in the U.S.A. So, there was a continual angst between these rival groups. Jesus and the Pharisees and Sadducees often had their differences. It was always one-sided, because Jesus exposed their evil intents, reducing them to speechless, religious hypocrites. Some of the Pharisees and Sadducees actually became secret followers of Jesus (John 3:1; 19:38), so they weren't all bad! Most of the members of these groups, though, despised Jesus of Nazareth. They hated him so badly that they wanted him dead. Many times through Jesus' three year ministry they unsuccessfully tried to capture and kill him. The Sanhedrin (aka High Council) members were gathering information and secretly plotting Jesus' death. Not long before this trial Jesus had raised Lazarus from the dead down the road in Bethany. The Jewish people were excited about this feat, many of them becoming followers because of the miracle. The Jewish Scribes, Pharisees and Sadducees, however, became envious and spiteful. Their rage led them to the Sanhedrin with the news of Jesus' miracle. The high council quickly convened and after a brief discussion they concluded that Jesus was a threat to the national sovereignty of Israel. They were afraid Rome would hear about Jesus and destroy the Temple and the nation. Therefore, they surmised, Jesus Christ must die in order to save Israel from destruction (John 11:45-53). The final plot to kill Jesus commenced at that point in time, but the plan would begin after the approaching Passover Feasts. The Sadducees and Pharisees feared a public rebellion if Jesus was executed before the Passover. They created a scheme to arraign Jesus on charges that he was leading an insurrection against the Roman government. It was quiet until Jesus approached Jerusalem in his triumphal entry (Palm Sunday). At roughly this same time, Judas Iscariot made it known to them that he was willing to betray Christ. The Sanhedrin finally had their accomplice to help them catch Jesus. Jesus' Last Supper arrived and Judas was unmasked as Jesus' traitor. Satan fully possessed Judas at this point and he fled Jesus and the apostles in order to betray Jesus to the Sanhedrin. The evil plot was forced to happen before the Passover. A couple hours later the Sanhedrin sent the temple guards and Roman soldiers to arrest Jesus, who was in the Olive grove exactly where Judas told the Sanhedrin leaders. Judas' kiss identified Jesus, who was arrested and brought to the High Priest, Annas. The honorary Chief Priest Annas began the trial during the night, which was absolutely against the law. No Jewish court proceeding was to begin before the morning sacrifices. Neither were court proceedings to be held in secret - they were to be public trials with access to all. Further, Annas and Caiaphas were not to sit alone on the judgment seat (Deuteronomy 19:16-18). Jesus, by Jewish law, wasn't required to witness against himself, but here he was questioned before he was formally indicted! Jesus said, "If I have spoken evil, bear witness of the evil; but if well, why do you strike me?" Jesus' refusal to fall victim to Annas' illegal court proceeding soon exasperated Annas, who bound him and sent him to Caiaphas, the High Priest. 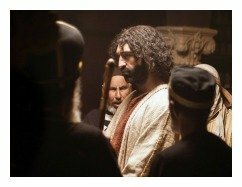 The High Priest, Caiaphas, opened court proceedings with the intent to formally charge Jesus with crimes worthy of a Roman death sentence. Almost all of the Sanhedrin members were seeking people to witness against Christ. 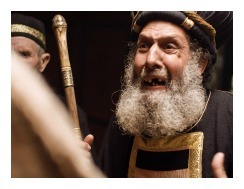 The inability to find at least two legal and credible witnesses frustrated Caiaphas (Mark 14:56). The false witnesses contradicted one another and would have been disposed of in a legal court proceeding. 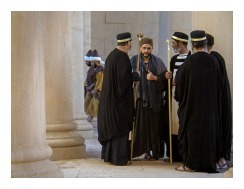 After two witnesses twisted a certain teaching of Christ about the Temple, Caiaphas formally charged him with high blasphemy for claiming to be able to perform a miracle. For the record, Jesus said he could tear down the temple and raise it in three days; however, he was talking about the temple of his body (John 2:18-21). Caiaphas asked Jesus to respond to the formal charge of blasphemy, a crime punishable by death (Leviticus 24:16). Jesus refused to speak (Isaiah 53:7) and he was under no demand of the law to answer to the charges. Caiaphas knew the law, but he was desperately trying to lead Jesus to incriminate himself. No credible witnesses had yet to come forth, so Caiaphas was grasping for testimony against Jesus. Caiaphas was enraged at this point, and he placed Jesus under oath, demanding that he answer to the charge that he claimed to be the Messiah, the Son of God. Jesus was now ready to disclose his real identity. Jesus wanted his full identity made known in a formal pronouncement for all time - for the annals of history! Jesus said, "You have said it. And in the future you will see the Son of Man seated in the place of power at God’s right hand and coming on the clouds of heaven.” Jesus finally revealed to the world that He is God's Son, the Messiah! (Daniel 7:13-14). Caiaphas illegally tore his official robe (Leviticus 21:10) in a hypocritical and overly dramatic display of disgust against Jesus' "blasphemy." They finally caught this rebel! Jesus was guilty of blasphemy and must be put to death! (Deuteronomy 17:6). The Sanhedrin, led by the two Saducees, Annas and Caiaphas were about to formally present their "Criminal" to the governor, Pontius Pilate. The guards began mocking and beating Jesus and the humiliation of the Lamb of God continued. Soon, Jesus, on the cross would be an official historical reality. Annas, his sons, and son-in-law, Caiaphas, authorized the temple trades of money-changers and livestock selling. They gained huge royalties from the businesses and vehemently protected them. Jesus despised the money-changing and livestock businesses taking place in the temple courtyard (John 2:13-16). These high ranking Saducees were aware of Jesus' opposition and also aware of his growing popularity in Jerusalem. They had to stop him before he ruined their religious profiteering. These men were first and foremost politicians and businessmen. Their religion and love for God was non-existent. The Saducees were willing accomplices of Satan and Judas in physically murdering Jesus Christ. Wow! So, after letting this all sink into our minds, we can finally answer the age-old questions, "Who killed Jesus?" and "Did the Jews kill Jesus?" Let's start in order of guilt, from top to bottom. Satan hates Jesus and desires his eternal throne. Satan's ploys are all targeted to bring down Jesus. Humans are no match for Satan, so these tools who we're about to talk about were simply pawns in his game. Satan is the most guilty, by far. Judas was Jesus' intimate friend and disciple. Above all, Jesus should have been able to trust Judas. Judas committed the worst act of betrayal possible, therefore, he is the most guilty human of all. The Jewish religious leaders, professing to be God's priests on earth, envied Jesus. He was a threat to their religious institution and their profiteering ventures. They were jealous of his works and envious of the crowds that gathered around him. They are immediately behind Judas in culpability for Jesus' death. The Romans were drug into the picture by the Jewish religion leaders. They would not have been involved had the Jews not forced the issue. Their sheer brutality, however, will be accounted for on judgment day. Finally, this one hurts to the core, but, here goes... we Christians are the ones who ultimately sacrificed Jesus on the cross. We hung him on the tree. Our terrible sins separated us from God, and in his mercy and love, God created the best possible plan to bring us back to him. Jesus, on the cross, is our fault. We are culpable (Colossians 2:13-15). Thank God for his grace, though. Jesus paid the debt and Christians are no longer held responsible for Jesus' death. Jesus is our Lamb, Savior and Lord. For this reason, above ALL else, we must become his true disciples. We owe Jesus our lives. Jesus was murdered by the Jewish religious leaders. These God-hating Saducees, Pharisees and Scribes influenced the masses to join in their evil plot against Jesus. They refused to accept God's Son, Jesus Christ as their Messiah. They didn't believe in Jesus' miracles, ministries or teachings. They rejected the claims and proofs of the prophets that he was God's Son, the Messiah. And they rejected Jesus' testimony about himself. Not stopping there, they falsely convicted Jesus of blasphemy. Think about that for a moment. They convicted God's Son of blasphemy against his Father. They convicted God of blasphemy! Did that sink into your mind? Twisted, perverted "justice" does ridiculous things such as this and that is exactly what happened. These trials of Jesus were bogus, because they relied upon false witnesses and were carried out totally illegally. The Sanhedrin convicted God of blasphemy, but it turns out they themselves were guilty of that very thing! Yes, they blasphemed the Son of God, and they were about to murder him, too. But, they're no more guilty than you and me. We need to let that sink into our souls. Next lesson: Peter Denies Jesus #3.08. 1) What does the rejection of the supernatural eliminate in the belief system of an individual? 2) What effects do the rejection of the supernatural have upon the Saducees in relation to Jesus? 3) Why does allowing politics and business into pure religion always dilute, corrupt and finally ruin the religion? To stand innocent before our Father. After sharing this Bible study lesson on Facebook or Twitter below download your FREE printable Bible Study Lessons (pdf version): Sadducees, Lesson 3.07. Please Donate To GG.com! Special Note: I'm grateful to Big Book Media & Free Bible Images, Stock Exchange, Morgue Files, and Stock Photos For Free for the use of their photos for our Sadducees Bible study lesson.